It all started on Valentine's Day, 2013. A ragged black and white cat randomly showed up in the distance outside of what is now the M$M office. Like most wild cats, it was probably hoping for food, shelter, and some semblance of warmth for the night. I specifically remember that it was freaking cold (as Texas goes) the first time I saw him, and if you own a cat or care about animals at all…you would have felt badly for the guy. He sat about 30 yards away from the building out in the bushes every night for the next couple of weeks, and immediately ran at the first sight of a human or noise. I honestly didn't think much of him when he started showing up. Admittedly, I own two cats and buy an unbelievable amount of cat food every month, but I really don't consider myself a cat person at all. They never come when you call them unless you have food. They are not dependable in an emergency situation. They randomly knock your crap off of counters for fun. My kitten literally poops on her own tail and flings it around the house like it's a sick game. I've been victim to cats peeing on my clothes, peeing on my furniture, biting me repeatedly in the middle of the night, jumping on me (also in the middle of the night), throwing up on my mattress, coughing up hairballs in my office, and drinking out of my water when I set it down. If house cats were bigger, they would eat/kill us for fun. Think about it. 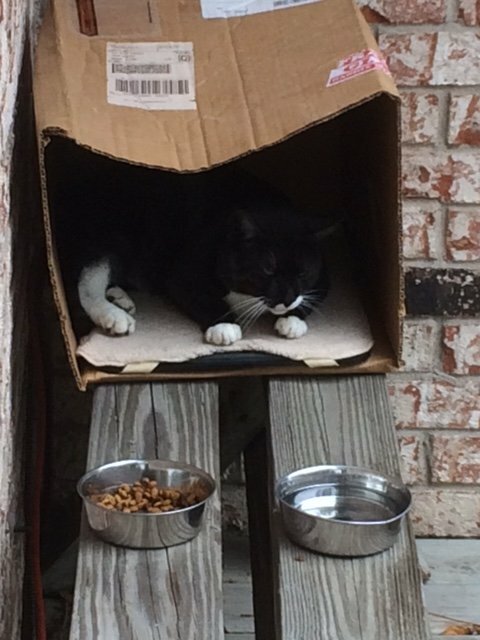 For whatever reason, my friend Jim that owns the building that I work from had a vision for this black and white cat. He saw potential in this animal. He wanted to bring the cat inside and eventually domesticate it. After discussing one night we estimated that it would take about 6 months to get the cat used to humans and ready to live inside. he first month was simple. Jim started by feeding the cat twice a day. Because he was first seen on Valentine's day, the cat eventually picked up the name “Rudy Valentino”, or affectionately, “Rudy”. Rudy needed something warm to sleep in. Unfortunately his sleeping area of choice was inside of another friend's boat that was also being stored on the property. At one point there was an electric blanket placed in the boat for Rudy, which led to an entertaining argument about potential fires and UL vs. Non-UL safety labels on items from Wal-mart. Needless to say, Rudy's heating blanket was moved to a cardboard box closer to the office. 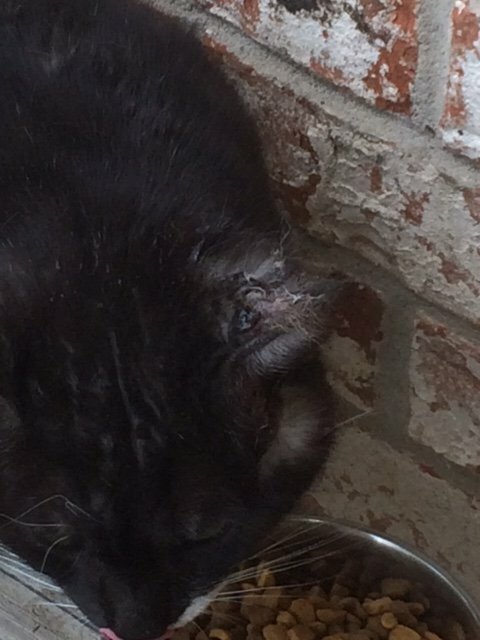 Rudy had a bunch of issues – he needed to be fixed, he came up to dinner with wounds from fights, and his coat always looked pretty rough. Every time Rudy came up to the office with a new problem, Jim always tried his best to take care of the cat – even though Rudy wouldn't let humans touch him. months had come and gone, and Jim wasn't even close to getting Rudy into the office. There was progress every month, but my goodness it was slow. It took weeks to even get Rudy 2-3 feet closer to the office. Jim never gave up though, and religiously fed Rudy twice a day, every day (including weekends). He called his name the same way, whistled for him the same way, and never tried to reach out and pet Rudy for fear that it would set back the entire process. I'm sure you are wondering why I'm talking about a cat on a financial blog. It's actually pretty simple really. For Jim, getting Rudy into the office became a long term goal just like the many financial goals that we create in life. Jim and Rudy remind me of the same struggle that I faced paying off my loans, starting my own company, and my quest to build real wealth. Financial goals often seem so far away, and the progress is almost non-noticeable. For a lot of people out there, making a mortgage payment or student loan payment feels like throwing a stone into an ocean. It's easy to give up and make minimum payments. It's easy to say “screw it” and start financing things because you feel like you won't ever get ahead. It took almost 3 freaking years to get that cat into the office. 3. Freaking. Years. (It worked). I love the analogy. And I love cats. I think there are excellent lessons here regarding commitment, perseverance and patience that apply to many kinds of goals, but most especially goals involving money. Awesome post! Thanks! Jim told me that it had been three years with Rudy and I couldn’t believe it! Money lessons aside – it takes forever to get a cat to trust you. I agree that cats can be total a$$holes (mine also like to drink out of my water glass when I’m not looking), but I love them anyway. I also absolutely agree that progress toward goals can feel frustratingly slow sometimes. I still have $95,000 of debt left to pay off, and it feels endless. But every extra little bit that I put toward my student loans does make a difference, even though it feels like throwing a stone into an ocean. He is doing just fine. He comes in every night now and has his own bedroom in the office with a bed, litter box, food, and water. 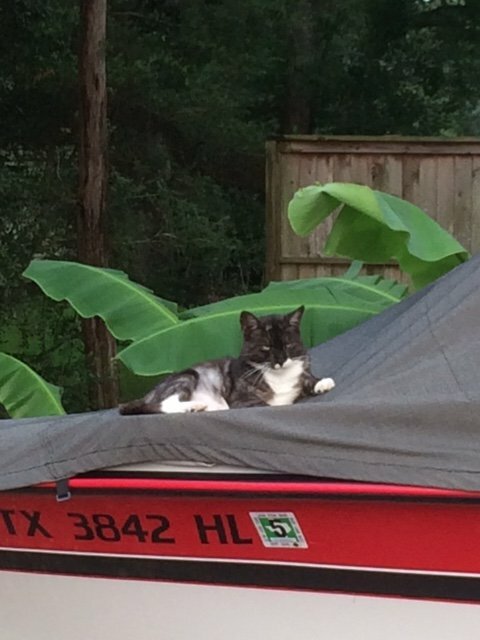 He still goes out during the day and still sleeps the day away in the boat. He will let me ( and only me) pet him. He will not let anyone else near him. He is now on Revolution (a flea medication) once a month and now has a soft and shiny coat. When I am outside working he will follow me around but not too close. So, as always, we are getting closer.